Whether you’re an avid opera fan or not, a night at the Arena di Verona is a goose bump inducing experience. The Arena di Verona is a Roman amphitheater built in AD30. When it was originally built it was located outside the city walls, but now it’s right in the middle of the city of Verona. It’s an impressive structure both in size and how well it has been preserved, a fascinating piece of history of life from almost 2,000 years ago. Every year they host the Arena Opera Festival, usually running from late June to September. I will admit, I didn’t even know about any of this until a random conversation I had with someone who had just got back and showed me their photos. I knew I had to see it for myself and now it’s on my travel wish list every year! I am #obsessed. A couple days after that conversation I walked past my local travel agent window (yes, travel agents still exist and long may they – another blog coming on that soon) and by some strange fate of the Roman Gods they were promoting a package to Verona including 3-nights at the Hotel Giberti and tickets to the opera Carmen. Verona is a beautiful city and well worth a visit even without adding in the opera, however, the night at the opera was the Verona experience that stays with me the most. The moment you arrive at the amphitheater the atmosphere is special, people are excited and the anticipation creates a buzz. Then when you step inside the arena…you just know you’re in for something spectacular. The performances usually start at dusk, so as you sit and wait the sun slowly sets, the light changes and the silhouette of the arena is magical. It’s easy to imagine the Romans sitting on those same stones waiting for the gladiators to step into the ring. The moment the orchestra starts my goose bumps arrive. There are a few different seating options and costs, my advice would be to really consider a higher price point if you can. These performances are long and you will be in your seat for about 4 hours – Roman stones can get hard after an hour or so! You can rent cushions for a little extra comfort, but not much. The stone seating doesn’t have seat backs (how thoughtless of the Romans not to think of this) so you are sitting upright, on stone, the whole time. Also, this festival is in the middle of summer and if it’s been a hot day, those slabs heat up and stay hot. If you do go for the unreserved seating arrive as early as possible to get the best spot. The poltronissima levels are upholstered seats with backrest, like a traditional theater seat. Still probably not the most comfortable seat you’ve ever sat on but a definite improvement. Visit the seating plan of Arena di Verona here. There is a wide variety of fashion so wearing something comfortable is a good place to start. The poltronissima seating section dress code is “elegant”; lots of women wore beautiful cocktail dresses, some men were in black tie and then there was everything in between. If you like dressing up in something special then go for it, you won’t be out of place here. On the flipside, there were people in jeans and casual attire so don’t be put off by, “having nothing to wear”! As I mentioned before, these operas are long and don’t start till dusk which is around 9pm, so some performances will end around 1am. My recommendation is to eat before hand but don’t drink too much as the bathroom may be quite a hike up and down stone stairs, in the dark. There are plenty of great places to dine around the arena and we stumbled across a little place down a side street for a delicious bowl of pasta and glass of wine. The official rule is no outside food or drink in the arena (your bags will be searched). They do serve food and beverages inside at of course inflated prices. 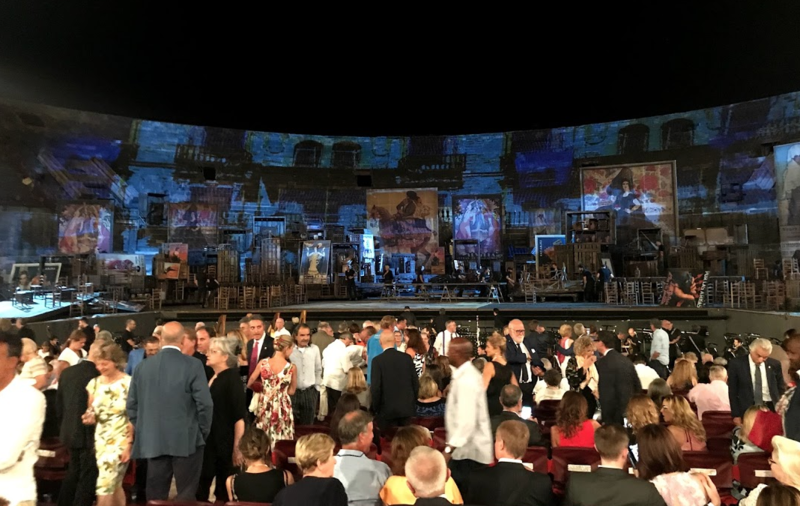 The 2019 Arena Opera Festival looks to be as spectacular as ever with La Traviata, Aida, Carmen, Il Trovatore and Tosca being performed on this one of kind stage. They also have a special evening with Placido Domingo to celebrate their 50 years of opera. You can find out all the details here.